Like fashion and food, facial treatments are subject to the latest trends, all in the quest for ageless beauty and a healthy appearance. Recent trends in facials run the gamut, from ultrasound to cryotherapy, dermaplaning to microneedling, snail slime to bird poop. Exotic botanical extracts briefly share the spotlight with new breakthroughs in cosmetic chemistry that lead to the launch of the next high-functioning skin care product. In this day of the global consumer, the latest trend in facials has arrived: East meets West, wherein meridian massage has fused modern Western esthetic techniques with traditional Chinese medicine (TCM). Estheticians who incorporate TCM and Meridian theory into their existing facial services create a unique and customizable experience for clients who seek facial rejuvenation as well as enhanced inner and outer well-being. Until recently, TCM and meridian theory were mostly overlooked by Western medicine, but the principles used in meridian massage are currently gaining traction among scientists, doctors and licensed estheticians. Moreover, acupuncture points are located along meridian pathways and have been mapped electronically, radioactively and thermally, yet an experienced and mindful esthetician may actually feel them while performing a meridian massage treatment. Meridian facial massage has been shown to awaken the skin's natural ability to regenerate, firm, and lift the face, while also improving microcirculation, toning facial muscles and clearing lymphatic pathways—and ultimately leading to an overall improvement in bodily health. The Eastern system of meridian theory first appeared in a Chinese medical text dating from the third century B.C. and serves as the foundation of TCM. 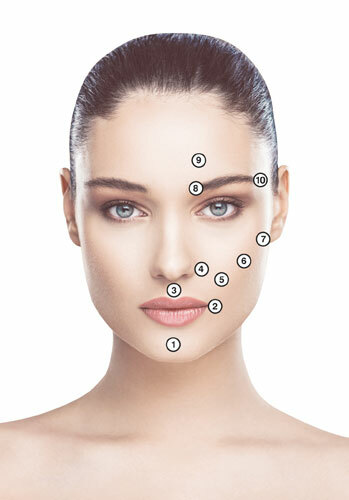 Meridian theory focuses on "Qi," known as "life energy," which flows through 670 meridian points, 10 primary facial meridian points and 20 major pathways or "energy freeways" that connect different parts of the body, from head to toes. When pathways for the body's natural flow of energy are obstructed, the body enters into a state of imbalance, stagnation or even disease. Massaging the body along meridian pathways detoxifies, clears and unblocks energy in order to restore a balanced, healthy Qi flow. Muscular system: Meridian massage smooths out wrinkles and folds in the facial fascia, eases inflammation, and soothes muscle tension. Circulatory System: Meridian massage enhances microcirculation, clears stagnant blood flow, and helps relieve chronic inflammation. Lymphatic System: Meridian Massage improves lymph flow to help remove toxins, ease congestion, and reduce swelling. Meridian Theory: Meridian Massage restores a balanced, healthy Qi flow and creates a sense of overall well-being. Using "tribo-effleurage" or "friction-stroking," meridian massage includes specialized tools that stroke the skin in the direction of the flow of blood and lymph, promoting circulation, removing toxins, lifting and sculpting sagging facial contours, minimizing fine lines and wrinkles, and improving radiance and texture. As if that weren't enticing enough, meridian facial massage leads to an overall sense of well-being, since meridian points and pathways on the face and scalp directly connect and communicate with vital organs and tissues. The facial skin even exhibits signs of either Qi balance or Qi blockage throughout the entire body. Meridian facial massage clears the flow of Qi throughout the body, leading to an enhanced sense of overall well-being, in a single facial treatment. Often defined as a healing and energizing crystal, jade contains many beneficial minerals and trace elements such as iron, copper, manganese, cobalt, lithium and calcium. 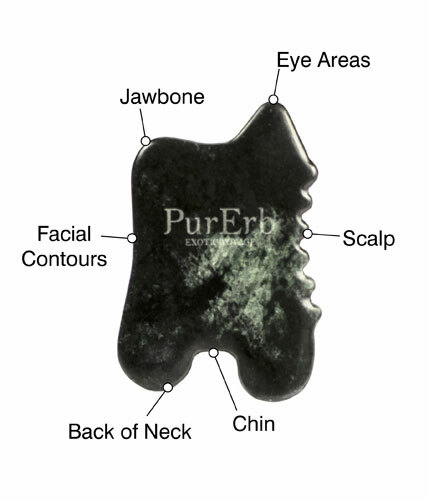 The specially shaped Mountain Shan jade tool is used in customizing meridian facial massage strokes to relieve blockage, assist in discharging toxins, and increase the flow of energy, and improve the complexion. Dull, aging skin immediately appears brighter, smoother and healthier. Other unique meridian tools include Celadon Meridian Crown, a symbol of power, victory and universal energy. The gentle curves, scallops and smooth edges of these distinctive tools open meridian channels to guide the flow of energy, while instantly easing tension, enhancing microcirculation, minimizing puffiness, and lifting, firming and tightening the skin. Meridian facial massage starts at the scalp ("the governing vessel"), continues at the décolleté and the 10 primary meridian points on the face, and culminates by sweeping the toxins down the side of the neck. Step 1: Press scalp along meridian pathways to release energy blockage. Step 2: Massage Meridian scalp oil into skin along meridian pathways on scalp. 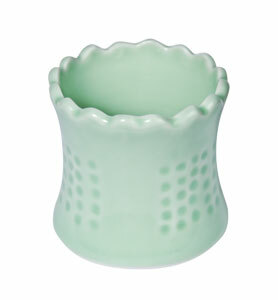 Step 3: Press and release Celadon Meridian Crown in an upward and outward direction along meridian pathways on scalp. Step 4: Cleanse facial area. Pat dry. Step 5: Apply facial oil or facial balm to face, neck, and décolleté. Step 6: Use Mountain Shan to perform slight strokes on the décolleté, moving from left to right, then right to left. Step 7: Starting from each of the 10 primary facial meridian points, use Mountain Shan to perform slight strokes upward and outward. Step 8: Cover face, neck, and décolleté with a warm towel. Remove. Step 9: Optional: Apply sheet mask. Perform meridian massage over mask. Remove mask after 15 minutes. Step 10: Apply toner, serum, moisturizer and sun protection as needed. Despite the trends that ebb and flow, the goals of facials remain consistent: clients desire "designer" pampering as well as results-driven, customized treatments. These goals can be attained through the merging of Eastern and Western facial modalities, which utilize techniques that are non-invasive and simple, yet highly effective and comprehensive. Estheticians who broaden their range of facial services by integrating East and West will transcend the latest trends, setting a new standard in professional beauty treatments while sending their clients on an exotic journey toward ageless beauty and improved wellness.